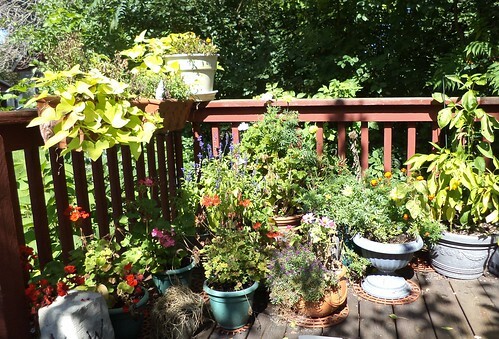 In another month, I'll be clearing out the flower pots and putting everything away for the winter. I have these observations from this year's garden. 1) Too much. I have a lot of pots. I don't have to fill every single one of them. I believe the peppers would have done better with less around them. I would not have felt so overwhelmed and let things get a bit too leggy. There will be much halving of geraniums when I finally bring them inside. 2) While the banana peppers were prolific, I'm not into banana peppers. Next year, bell peppers only, maybe nothing but chocolate peppers. If I'm going to plant my own plants, I need to start them in January so they are nice and tall and strong by May, when they go into the pots. I only need 4 plants, if that. 3) Too tall. I need to, when I select plants, make an effort to search out low growing plants, other than alyssum. It's not weedy. It's just a lot of tall plants and that makes those who are lower growing strive to be tall and they don't look good. No 3 foot tall marigolds next year. 4) I don't need to start sunflowers inside. The Teddy Bear sunflowers I planted directly into the pot in 2012 did far, far better than the ones I started in March. These were quite stunted this year. I don't know if that had something to do with being crowded, but they just didn't grow well. 5) Sweet potato vines are excellent for adding color and dimension. I happened to notice this in the vine on the left. That looks, suspiciously, like a tuber. 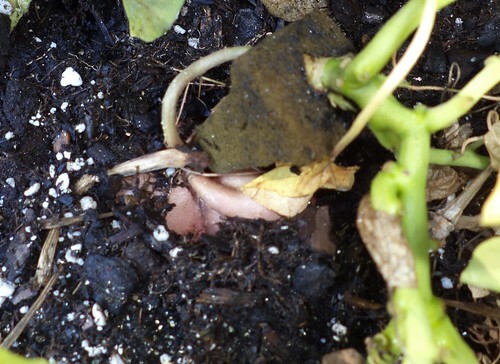 In October, when I pull up the 4 vines I have, will I have sweet potatoes I can eat? That would be an added bonus to planting the vines. I haven't found an answer to this question. This space was wonderful this year. I very much enjoyed the time I spent out here. It helped that we had a cooler summer. Today, not just myself and Pilchard enjoyed the deck. This visitor came by. 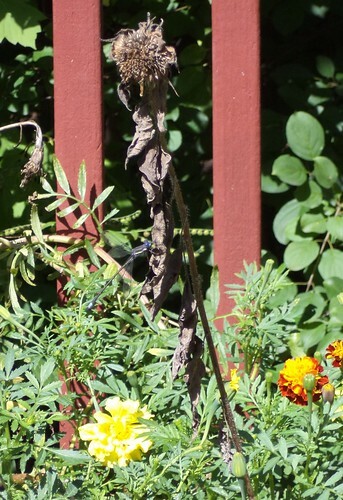 On the desiccated husk of a sunflower is perched a dragonfly. I know the birds have enjoyed this space. The squirrels are starting to bury nuts in the pots so they have enjoyed this space. It's nice to see that I have a mini-habitat for this fragile creature.